Pauline Clark has got it goin’ on.Today’s post is about holding on to a dream that you know is good for your soul. Pauline Clark is my inspiration today and she is featured in the story below that I read in the New York Daily News about how Pauline’s lifetime dream of dancing with the Rockettes finally came true. I think Pauline Clark, who is 87, has definitely heard about the idea of “use it or loose it” and has taken it to heart as a lifetime philosophy. The idea behind “use it or loose it” is essentially this: if you don’t use the strength and mobility of your body on a regular basis as you grow older, then you might loose those functions. I try to practice it as much as possible. If I don’t walk or move around every day, I just don’t feel right and neither does my body. Pauline Clark, 87, from Clearwater, Fla., realized her lifelong dream of dancing with the world-famous steppers Saturday after the Wish of a Lifetime foundation teamed up with her senior center to bring her to the Big Apple. 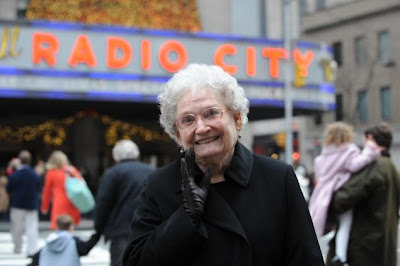 The Rockettes had better watch their step, because this great-granny is hot on their heels. Clark, who has been dancing since her brother insisted she get lessons at age 7, enjoyed a matinee performance of the 85th annual “Christmas Spectacular” (which is two years younger than she is) before taking a backstage tour. She had never seen the Rockettes live before. Of course, the highlight was becoming the oldest person to dance with the long-legged lovelies during the Rockette Experience, when about 50 guests took a dance workshop and posed for photos with three Rockettes. A choreographer walked them through the troupe’s signature kick line. The silver-haired siren has eight decades of dancing under her feet, including her years teaching at the Arthur Murray School of dance in Tallahassee, Fla.
Clark still tears up the dance floor at the Brookdale Senior Living center’s senior happy hours on Saturdays.